QUESTION: Numbers of type 2 diabetics is going up day by day. Eating habits, stress and modern activities are responsible for it. Doctors are telling not to eat sugar. What is the next step? Is this all? It is true that diabetes is becoming a very popular disease, changing the lives of all of us. Sometimes, the bad lifestyle leads to diabetes, but in some cases there is a viral infection, which leads to these changes. As you probably can imagine, there are two possible options for you to treat your diabetes. 1. The first is to start using drugs and 2. secondly, to start using herbs along with diet and exercises. You have to know that the usage of drug is obligated at the advanced stages of this disease. 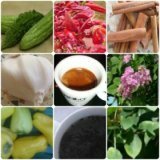 So, because of this, it would be better for you to start your own daily regime, composed by the herbs usage, diet and exercises. Important fact is that there are a lot of herbs on the market used for diabetes treatment. However, not all of them are effective and cheap at the same time. The bitter melon juice can be found almost at every market, when it is advisable to drink about 40-70 ml of it every single day. market at the form of capsules, so it is even easier for you to use them. You have to know, that avoiding the consumption of sugar is not the only thing you have to do about the better control of your diabetes. Avoiding to eat foods rich in cholesterol at the same time is beneficial, because damages in the glucose metabolism (diabetes) lead to damages in the lipid metabolism too. In addition, try to prepare a daily meal regime, composed of 5-6 small meals a day, where foods and vegetables compose the majority. In this way, you will ensure your body constant intake of nutrients and you will keep your blood glucose within the normal ranges. Doing exercises is another healthy way to beat diabetes naturally. Walking for about an hour in the morning and running for 30 minutes in the evening will help you to use the excessive amount of sugar in your blood. If you try to combine all these things together, you will postpone the usage of drugs for pretty long time. Besides this, you will prevent the development of the diabetes’ complications, which may cause you a lot of troubles.